At only 7-years of age, this modern townhouse in Lidcombe was already visibly sinking from the outside. It would even creak when you entered. Despite the townhouse’s modern, high-quality structural build, the inside of the house was showing damage. Rooflines and supporting walls were starting to separate and walls cracks had also started to emerge and grow around the structure. Alarmed, the owner reached out to us. 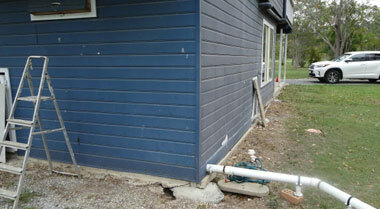 Interestingly, upon our arrival and initial inspection we couldn’t find the source of subsidence and damage right away. The reasons for the townhouse’s subsidence and structural damage remained a mystery – but only for a little while. We looked for overflowing gutters, broken down water pipes and damaged storm water drainage in the local area, but none were present. This ruled out soil erosion. After testing the ground, reactive clay soil was nowhere to be found either, so we ruled that out too. After further investigation, we came to the decision that poorly compacted ground under the townhouse’s foundations was the reason for the high-speed subsidence. On the day of repair our suspicions were confirmed. Our team of onsite engineers discovered large voids under the townhouse foundations. The townhouse had been built on a construction site garbage dump. Piles and piles of old building materials such as crushed brick had been decaying under the townhouse causing the structural shifts. Decaying construction garbage under the townhouse was causing it to subside quickly. Our top priority was to fill the voids that had formed from the decay and then stabilise the ground. To do so, we injected our own unique ground stabilising solution, GeoPoly™, under the house and its walls, directly into the sizeable voids and decay. This solidified all the shifting materials under the house and gave it firm ground to sit upon. After fixing the foundations, we took to repairing the wall cracks around the townhouse with our HelicalBar™ systems and crack stitching with masonry beams wherever required. We completed the project by filling wall crack gaps with a little render and giving the walls a fresh paint job. We restored rock-solid stability to the owner’s townhouse in under two days with our solutions without removing a single brick. Nothing was broken down or rebuilt and the townhouse looked as if brand new. In the end, we saved the owner tens of thousands of dollars in repairs and the owner is no longer concerned that the house is sinking. The townhouse no longer creaks either.